If there's an odd familiarity to this installation it’s probably because Holy Mountain was an influence, as it mentions in the exhibition statement. 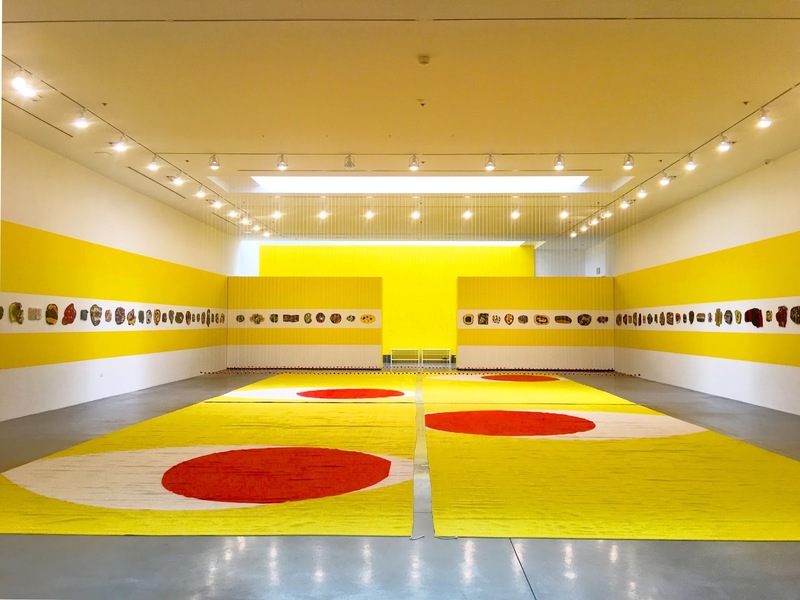 Transforming the space by activating the floor is in Polly Apfelbaum’s wheelhouse, but in Face (Geometry) (Naked) Eyes, Apfelbaum deftly activates the perimeter and other parts of the space as well. Bold, primary, formal choices dominate overall, such as the stripe which frames a diverse series of wall mounted ceramic pieces. These eccentrically shaped ceramic paintings contribute multiple layers of contrast and linkage throughout the installation. The rough, intimate, individual quality of the ceramic pieces pop against the immaculately designed hard-edged environment. 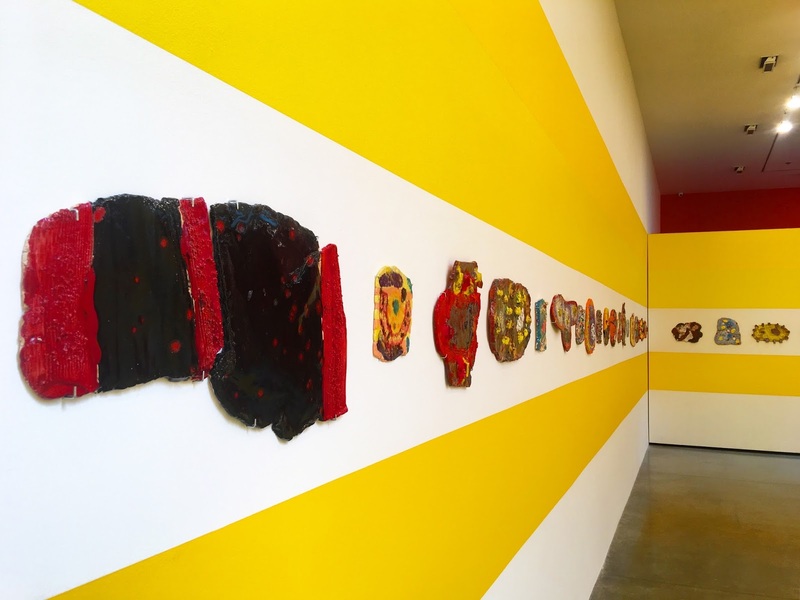 This also connects and contrasts the hand-woven floor pieces designed and produced by Apfelbaum with weavers from Oaxaca, Mexico. The back and forth is amplified by the handmade ceramic beads suspended over the rugs. Each bead seems indistinguishable from one another until closer inspection reveals the unique, organic form of each one. 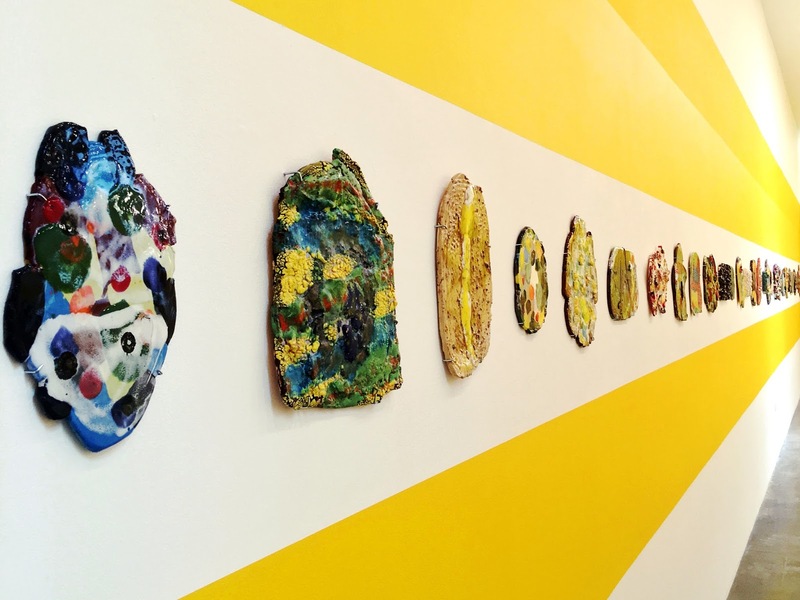 The ceramic paintings presented here highlight an intersection of ceramics and painting that is a recurring interest in the current moment. Allison Schulnick, Mary Hill, Ry Rocklen, among others have made use of clay’s materiality, presence, indexicality, and evidence of the hand to present objects that have undeniably painterly qualities. 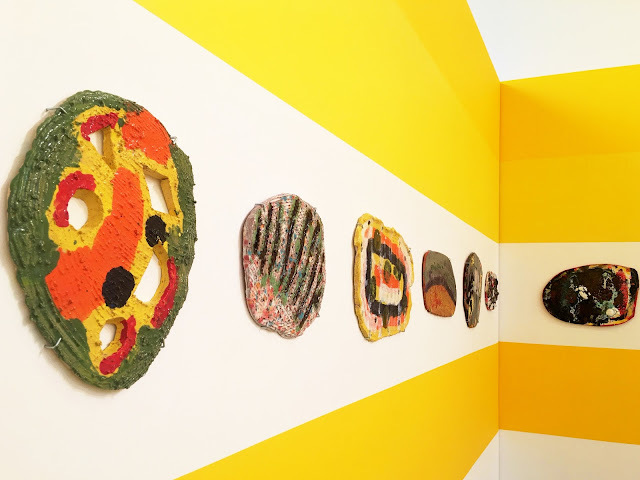 Apfelbaum’s wall mounted pieces read as shaped abstract works, faces, paint palettes, open books, plates, dishes, personal pan pizzas and more. The extensive sampling of these particular, tactile, craggy, bubbly, expressive works give viewers an opportunity for detailed, close-up looking. Face (Geometry) (Naked) Eyes as a whole is best taken in from wide angles, and the arrangement of rugs encourages this vantage point as viewers are forced to the perimeter (though there is the option of walking on the rugs with booties). The wooden wall pieces mounted in the back area come up a bit short. They are almost invisible from the entrance, blending in with the deep red background they're set against. 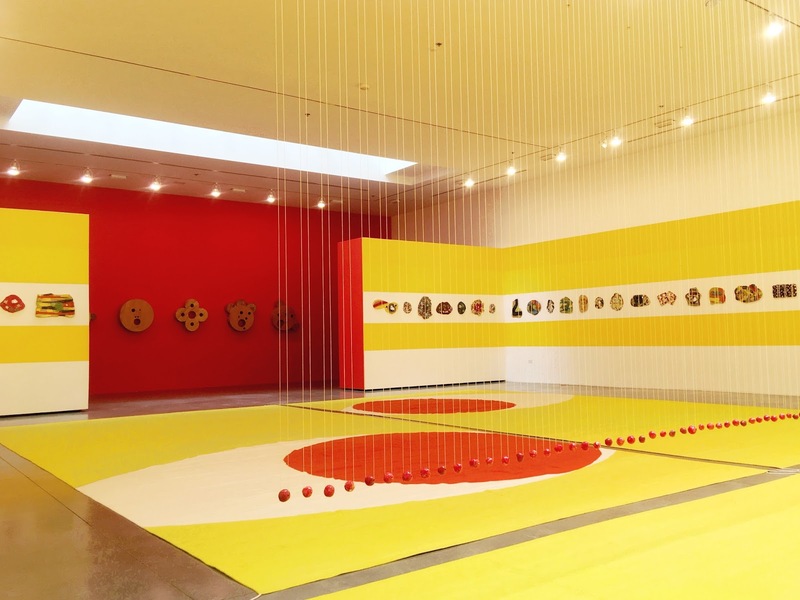 Upon discovery it’s easy to see their formal and conceptual links to both the ceramic paintings and the rugs, as well as the satisfying level of craft they embody. Though their camouflaged placement within the gallery also gives them the feeling of being tacked on, like an afterthought.